HESPI conducted a training workshop for its research staff on August 1-5, 2017, in Addis Ababa. 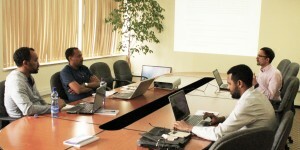 The training focused on the application of microeconometric techniques for impact evaluation using STATA. Techniques of impact evaluation including randomized control trials, double difference and propensity score matching were covered. The research team were able to acquire skills on how to apply the different impact evaluation techniques to a particular program evaluation.